Nick is 15 years old and has high functioning autism, which causes difficulty connecting with peers. As a young child, Nick had delayed social skills and often spoke using repetitive language. For a long time Nick’s parents struggled to help their son bond with others, calmly handle personal interactions and speak clearly when spoken to. That changed when Stitch came into Nick’s life. Stitch is a German Shepherd that became Nick’s service dog when he was 7 years old. When Stitch was with Nick, communicating with others was easier. People approached Nick, wanting to learn more about his dog, which gave him opportunities to practice social skills. Nick’s parents and therapists created a scripted response he could relay when asked about Stitch. Over time, speaking to others became more comfortable. Animal Assisted Therapy (AAT) can be incredibly beneficial for children with autism. According to www.AnimalAssistedTherapyPrograms.org, an animal in session can help a child with emotional awareness, behavioral management skills, communication skills, gross and fine motor skills, care-taking responsibilities, assertiveness, and appropriate social skills—many benefits Nick experienced as he began to work with Stitch. Proper AAT sets up effective intervention methods as a means for achieving established goals. A goal might be for a child to choose between two things. For instance, a toy or treat to give to the animal, or what direction to go with the animal. Another goal could be to learn how to take turns. AAT helps by having the child play fetch with a dog. Even untrained animals can help improve impulse control and teach empathy, which are often areas of difficulty for children with autism. According to Diana (a parent), her son loves chickens. They help him with impulse control because he doesn’t want to scare them. Although therapy occurs with all types of animals, the most common AAT is with dogs. 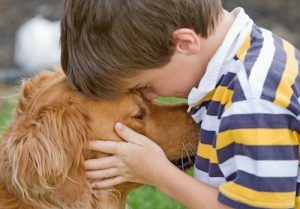 “Children with autism may especially benefit from interacting with dogs, which can provide unconditional, nonjudgmental love and companionship,” says Dr. Gretchen Carlisle of Research Center for Human-Animal Interaction. However, families of children with autism should carefully consider the pros and cons before getting a dog. According to www.autismspeaks.org, a child who is easily agitated or has sensitivities to noise may have great difficulty with an extremely active dog or one that tends to bark. Trainers often have different theories on training service dogs for children with autism. Some trainers match children with a dog after the dog is fully trained. Nick’s trainer instead matched him with a puppy that was brought home and trained with assistance from a team of trainers. The theory behind this type of training is that the dog and child build a very tight bond. Children also sometimes have behaviors that a puppy can adjust to more easily. Karen Johnson is a freelance writer.